"Often, when accessing services... when you go to your service provider, often having to come out to your provider in order to justify the services your asking for, and often having to educate the service provider... that can be very taxing for individuals," Redfern says. "Especially in a crisis state, that can make things more difficult for you." She says that people often have to shift out of their own needs to the needs to of the provider in educating them. "It can be emotionally, spiritually exhausting." This burnout can lead some people to completely disengage from accessing interventions, she says. Often when people speak about violence against Indigenous women, they refer to violence by men, says Redfern. This can often leave out 2-spirit or trans people. Iqaluit has a domestic violence shelter, Redfern points out. This can leave space for women who need help, but doesn't necessarily have policies in place for when a woman is the perpetrator of violence, or to deal with relationships between clients who are staying there. Redfern says that in Vancouver, there were community centres specifically for the LGBTQ2 community. These could provide appropriate services for clients, but also help provide cultural competency services for institutions. "One of the strengths of having services available for that is you have a centralized body that has the capacity, the time... to identify these barriers and needs, especially dealing with things on an as and when basis," says Redfern. Frontline providers are often running on a deficit of times and resources already, and it's difficult to find time to put these things in place. That can put clients at a higher risk of harm, and put service providers in the position to decide what is easiest and what is best, she says. "Not that it's necessarily going to change the violence that we experience, but there is also the ability to provide service on multiple levels," says Lightfoot. Highlights changing forms for intake at hospital or RCMP station, to changing education system. "What we're lacking is that organization of Indigenous LGBTQ2." Thomas asks if the panel has any feedback for how programs and services can be modified to include this information. Lightfoot says that including Indigenous people on boards is key. "There needs to be more visibility from Indigenous LGBTQ2 youth, adults, and elders," they say. "We should be a part of the process. Which comes back to the idea of consent. Consent should inform every step of the process." How do we better support youth and their experiences? Thomas asks. Redfern says that when she was working at NTI, they did a scan of services in the territory. She was surprised to find how many of those services were provided by youth, for youth. "It did make those services difficult for them," she says. "Many of them were high school age." She says that these groups need adequate support. "We would hope that there would be more supports in place to help youth be able to facilitate this." Talks about making program funding requirements more responsive to these programs. Understanding youth suicide risk is complicated, says Lightfoot, and spurs from a number of social factors. "We don't have a silver bullet to fix this," they say, but highlights the need to have safe spaces everywhere. Redfern is now speaking about the #DecolonizeSAAM project. SAAM stands for Sexual Assault Awareness Month. The project allowed people to discuss gaps in services in an online forum - "one thing young people are able to do well is to facilitate things that are low cost, that are easy to access." Topics included breastfeeding and substance abuse among parents. Redfern is asked about difficulty prioritizing conversations among marginalized groups. She uses feminism as an example: "once we discuss equality for women, then we can discuss equality for Indigenous women, then we can discuss LGBTQ2 Indigenous women... but we can't compartmentalize parts of ourselves." Lightfoot adds that it's important to ensure that histories are visible. "A lot of our experiences have been denied or hidden." Thomas asks about racialized and sexualized violence as it relates to resource extraction. "The violence that happens to us is linked to what happens to the environment," says Lightfoot. "We are the first environment." Lightfoot speaks about environmental violence, and a lack of choice for communities to participate in these industries. This is compounded when it comes to Indigenous women, and further for LGBTQ2 women. Now speaking about "man camps," which were discussed on Monday. These are temporary camps that lead to an influx of transient workers into a community, mostly heterosexual, non-Indigenous men. These camps have led to increased rates of sexual and physical violence, says Lightfoot. Resource extraction often happens in remote communities. "The people who are most vulnerable are Indigenous communities." A report from Pauktuutit shows that mining industry leads to increased rates of domestic and sexual violence, says Lightfoot. The report shows that Inuit women believe mining leads to increased alcohol use, loss of culture, and language conflicts, in addition to the previously stated examples. "When these industries happen, the environmental fallout... often impacts Indigenous women," says Lightfoot. "It impacts reproductive health, it impacts breast feeding. You're impacting culture and traditions. You're impacting the survival of the people." "When you do those things, and it's not popular to say it, but that is genocide." Lightfoot talks about methods used by the industry to circumvent meaningful consultation on these projects, including not translating documents, holding hearings in private rooms. "It can sometimes make you feel paranoid as an Indigenous person when you think about these things. Like, am I making these things up?" "I had to go out and get a Master's degree because I was treated as if I wasn't knowledgeable on my land and industry... I wasn't capable because I don't have those letters behind my name. Those are the small acts of insidious violence that happen to us." Lightfoot asks if they have any recommendations for dealing with language loss. "Our languages carry our culture, and our ways of knowing our world... there needs to be a priority to have language rights enshrined, so that immersion in their language is a reality for each Indigenous child." There are small things that can be done at home, Lightfoot says, but there should be "an onus and enthusiasm from non-Indigenous to also learn" if there is to be true reconciliation. "Changing the work environment to Indigenous language, that has to happen," they say. "I work in Nunavut, I should be speaking Inuktitut to all of you." Lightfoot presents a paper showing that if a youth is educated in their Indigenous language for the first five years of school, that their academic outcomes improve. "If we have to deal with the mining, the fracking, then at least give us access to immersion," allowing them to be more successful in the education system and participate more fully in these industries, if they are the only economic drivers in their communities. Tears in the room as Lightfoot shows a photo of a woman from her home community protesting fracking with a feather. There are at least 20 RCMP officers surrounding the woman in the photo. "They tell us to be peaceful, to protest peacefully, and what are we met with? Violence," they say. "Meanwhile, when we get raped, we can't get anyone to show up." 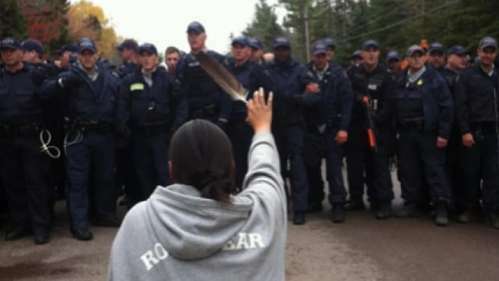 CBCA Labrador videojournalist was surprised to find out that a photo he took with his cellphone quickly became one of the most iconic images associated with fracking protests in New Brunswick. Redfern and Lightfoot are asked if they have any recommendations for the commissioners. "When we have these conversations, take note of who's here, but also take not of who's not here," says Redfern. "We're very fortunate to be able to speak with you, but we don't represent the entire LGBTQ2 community... we need to make sure we're not erasing anyone for administrative ease." Lightfoot says that treaties and land claims negotiations "need to be honoured, but honoured in a way that ensures we understand consent... there needs to be major educational reform." Counsel Christa Big Canoe now has questions for the witnesses, starting with pointing out that both Redfern and Lightfoot are parents of daughters. "When you think of your children, what are some hopes that they won't have to experience the things that you've experienced." "That's a thesis," says Lightfoot. "I want our families to be a part of the norm," says Lightfoot. "I want it to be OK to play mom and mom. I want her to see herself in books and love that." "I do want her to still be an activist," they add, with a laugh. "She already is." "I want to make sure that my daughter, no matter what, feels she has a voice, and a voice that will always be heard," says Redfern, fighting back tears. "I want her to feel like she always has a home and a place... I hope that she will always be proud of herself." Testimony for Redfern and Lightfoot has closed. We are now in a 15 minute break. Jefrey McNeil-Seymour will give his testimony next, followed by the start of cross examination.